It's hard enough to make original pictures, but with some subjects it simply borders the impossible. 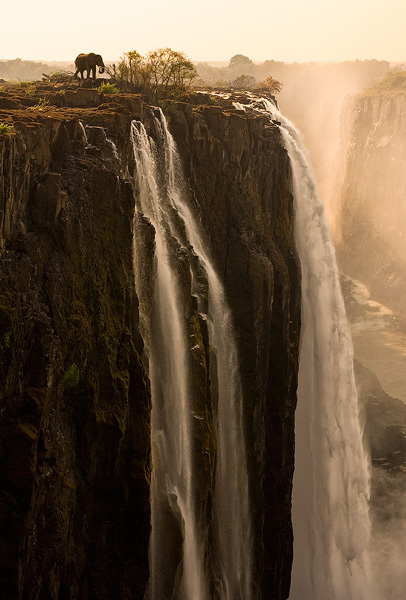 When I was at Victoria Falls, I thought about the billions of photographs that must have been taken there, and I almost decided to just visit the place without my camera. That was until I spoke with some of the local people, who told me that they had seen a bull elephant crossing the Zambezi river the day before. I decided to stay a few extra days and try my luck. On the third day I got lucky. The horizontal version of this unique image was featured as a double page spread in National Geographic, and won First Prize in the European Wildlife Photographer of the Year Awards.